The Baynūn museum, founded in 1990 by sheikh A. al-Huzeizi, focuses on antiquities found in Baynun and the surrounding areas, witnessing the history and culture of those great people who built up the ancient city of Baynūn. The inscriptions catalogued by the CASIS team are about 70, most of them very well preserved and inscribed on beautiful artefacts like stone altars, alabaster plaques, funerary stelae with face. 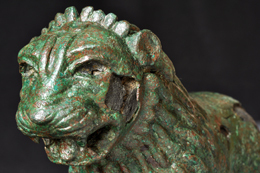 The collection is enriched with a valuable group of bronze objects, like a fragment of statue. The Baynūn museum also owns a wooden stick written in minuscule script. The great many unpublished inscriptions give us the first direct epigraphic evidence of these tribes dating back from the early centuries of the first millennium BC to the VI century AD, the last period of the history of South Arabia. Examples of the religious belief of Baynūn’s ancient inhabitants are votive objects such as altars, offering tables, incense burners and stelae with ritual scenes. The Baynūn collection is enriched with a valuable group of bronze objects, comprising animal and human statues, lamps, jewels, utensils. In 2007 the Museum of Baynūn was involved in the Italian-Yemeni project CASIS. Within this project the collection of bronze artefacts of the Museum was restored, catalogued and given as loan to the University of Pisa. In May 2009 an exhibition of the bronzes, after restoration, was organized at Pisa and subsequently replied at Ṣanʿāʾ the following July. Photos are courtesy of the Baynūn Museum.